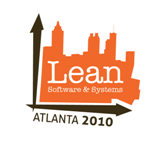 The Lean Software and Systems Consortium Conference is April 21-23. I’ll be attending and am looking forward to a great conference. The Lean SSC conference in Atlanta will be great. I’m already looking forward to more hand’s on content, empirical data, and reconnecting with colleagues from last years Lean and Kanban conference in Miami. My trip report from last year is on the Agile Executive blog for anyone interested.